Below is basic information on bail bond laws for Michigan concerning Bail Enforcement, Bounty Hunters, Fugitive Apprehension and Bail Bondsman. This is not legal advice as laws change frequently. Please check the links provided for possible updates and current information. Michigan Compiled Laws Annotated Chapters 760 To 776. Code Of Criminal Procedure Chapter 765. Code Of Criminal Procedure–bail Chapter V. Bail. § 765.1 — 765.28. Michigan Compiled Laws Annotated Chapter 550. Generalinsurance Laws Surety Companies 550.102 – 550.108. Contain some regulations that are relevant, though not specifically on point. Michigan does not have much on-point legislation dealing with the regulation of bail recovery agents or the bail recovery business in general. Michigan Compiled Laws Annotated Chapters 760 To 776. Code Of Criminal Procedure Chapter 765. Code Of Criminal Procedure–bail Chapter V. Bail 765.20. Deals with the financial requirements and liabilities for sureties. § 20. (1) A judge or magistrate may administer an oath to a proposed surety upon a recognizance given for the release of a person accused of a felony, misdemeanor, or ordinance violation, to ascertain his or her financial condition. A judge or district court magistrate may require a surety to pledge to the people of the state, real estate owned by the surety and located in the county in which the court is established. The value of the interest of the surety in the real estate shall be at least equal to the penal amount of the recognizance. If a pledge of real estate is required, the surety shall execute the usual form of recognizance and, in addition, there shall be included in the recognizance, as a part of the recognizance, an affidavit of justification in substantially the following form. The affidavit shall be executed by the proposed surety under an oath administered by the clerk, a district court magistrate, or a judge of the court. Michigan bail agent’s arrest authority. Michigan Compiled Laws Annotated Chapters 760 To 776. Code Of Criminal Procedure Chapter 765. Code Of Criminal Procedure–bail Chapter V. Bail 765.26. Set forth provisions for arrest and release of an accused by a surety. In all criminal cases where any person or persons have entered into any recognizance for the personal appearance of another and such bail and surety shall afterwards desire to be relieved from his responsibility, he may with or without assistance, arrest the accused and deliver him at the jail or to the sheriff of said county. In making such arrest he shall be entitled to the assistance of the sheriff, chief of police of any city or any peace officer. The sheriff or keeper of any jail in said county is authorized to receive such principal and detain him in jail until he is discharged in due course of law. Upon delivery of his principal at the jail by the surety or any officer, such surety shall be released from the conditions of his recognizance. At this time, there appear to be no specific regulations for “Bounty Hunters” in the Michigan statutes. 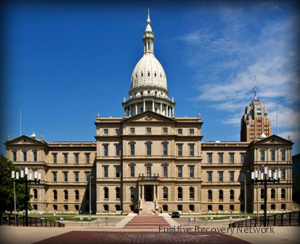 In 1998 Michigan passed S 820, the Bail Recovery Regulation Act, which was vetoed in December 22, 1998. Please check with the Michigan’s Department of Insurance, Licensing Board and/or Local Law Enforcement for the most recent updates. If you know of any updates to Michigan’s bail bond laws, please provide as much detail as possible and send to us using our contact form.